Reduced prep time. Reduced cooking time. Increased nutritious, home-cooked meals. And increased vegetable consumption. 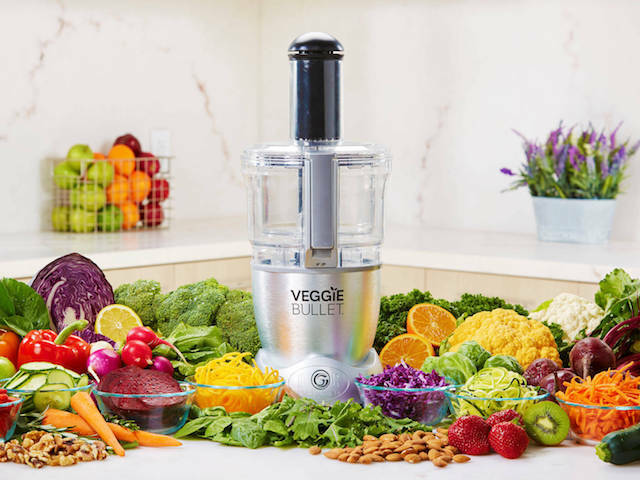 Introducing Veggie Bullet, the world’s first patented cyclonic spiralizer. With just the touch of a button, you can turn nutrient-rich whole foods into nutritious, complete meals in just minutes. Spiralize an entire zucchini in 10 seconds for delectable "spaghetti" and meatballs. Enjoy family-favorite curly fries for four in less than one minute. Or pop on the shredder/slicer accelerator for mountains of shredded cauliflower rice or a sliced veggie gratin. The possibilities are endless.